Haq's Musings: Will Karachi Stock Index Continue its Advance in 2011? 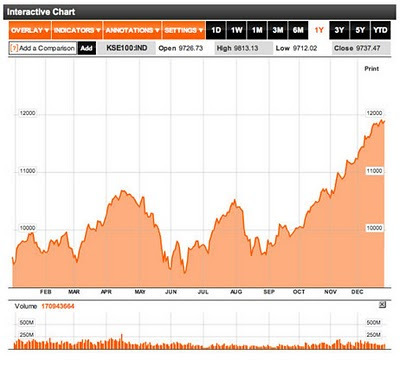 Will Karachi Stock Index Continue its Advance in 2011? "The bottom line is that Pakistan is not going to go away. We want to buy stocks that look cheap as prices come down as a result of the flood." Pakistan's main shares index KSE-100 rose 28% (26% in US dollar terms) in year 2010, as profits registered 14% growth and dividend yields of 5.2% in the companies making up the index. As of Dec 31, 2010, Mobius had 4.8% of his $17 billion Templeton Asian Growth Fund invested in Pakistan. The highest performing sectors were food and beverage (65%), oil and gas (40%), chemicals (30%) and personal goods(20%). These were followed by smaller gains in electricity, fixed-line telecom, automobiles, and construction materials, according to JS Global research. Oil and gas shares now make up 36% of KSE's total marke cap, a major shift from 2007 when financial services made up 31% of the Karachi Stock Exchange market cap of about $40 billion. Even with lower than historic average gains in a challenging year, KSE-100 easily beat the performance of Mumbai(+17%) and Shanghai(-14.3%) key indexes. Among other BRICs, Brazil is up just 1% for the year, and the dollar-traded Russian RTS index rose 22% in the year, reaching a 16-month closing high of 1,769.57 on Tuesday, while the rouble-based MICEX is also up 22%. After the 26% gain in 2010, the KSE-100 shares still trade at PE ratio of just 8, significantly discounted relative to KSE's historic price-earnings multiple of 10, and other regional markets of Shanghai and Manila at 15, and Mumbai at about 20. While the big interest rate hikes by Pakistan's central bank (SBP) to fight inflation have dramatically reduced liquidity for local investors, the massive economic stimulus (aka quantative easing policy to jumpstart the US economy) by the US Federal Reserve has unleashed a torrent of US dollars looking globally for good returns on investment. This is likely to continue to push shares in the emerging markets higher through at least 2011. The problem with the foreign institutional investment (FII) is that it can be very destabilizing for an emerging economy. It is often described as hot money, and it can leave as quickly as it comes in. Joseph Stiglitz, a Nobel Laureate Columbia University economist, has argued that India is more vulnerable to an asset bubble than China, saying that “strong economies that don’t yet have capital control become the focal point” for the liquidity injected by the US Federal Reserve. Stiglitz thinks that India, more than China or Brazil, should watch out for the tidal wave of money made available from the Fed’s quantitative easing. In Pakistan's case, however, the amount of FII has so far been very small relative to its market capitalization and the size of the country's GDP. If foreign portfolio investment dollars continue to come in at the same or even a bit higher rate in 2011 as they did last year, it will likely result in a healthy situation in providing necessary liquidity and help push the market up again this year. 1. Continued rise in exports, overseas Pakistanis' remittances, and other inflows for a healthy current account balance which ended in surplus of $26 million in 2010. 2. Enhanced domestic liquidity expected from the launch of new leveraged financial products in 2011. 3. Movement toward better manangement of the energy crisis leading to fewer blackouts and brownouts. 4. Progress on balancing the budget, with better tax collection and higher tax receipts in 2011. 5. Implementation of the IMF program, stabilization of prices, reduction in interest rates, and rising foreign exchange reserves. 6. Improvement in the overall security situation with perceptible reduction in violence. I put my money in bank here in America. I think if I put in Karachi stock I will doublle money quickly plus there is no tax I think. In US you have to pay tax. I don't know how to do That because I want to put my saving $15000 in Karachi. I think in 3 years I have $30000!. Please give me on your website. sohail: "I put my money in bank here in America. I think if I put in Karachi stock I will doublle money quickly plus there is no tax I think. In US you have to pay tax. I don't know how to do That because I want to put my saving $15000 in Karachi. I think in 3 years I have $30000!. Please give me on your website. " There are several US-based international multual funds that invest in Pakistan...names like Eaton Vance, Matthews, Templeton, etc. You can consider those as investment options, but clearly, it's not a good idea to put all your money in one place.. I suggest that you seek advice from a recognized international investment advisor before you do anything. Hope you are fine. Sir I am a student of Nust Business School and recently me and 4 of my friends participated in a competition by the name of CFA Global Investment Challenge. We pitched HUBCO to the Industry experts and Analysts as a BUY and won the first prize. Now we'll be representing Pakistan in the second leg of the competition in Bali, Indonesia. We'll be pitching Pakistan, KSE and HUBCO to the International Investors there for portfolio Investment. I was recently going through your blog where you have talked about KSE as one of the best stock exchanges of the world. I would like you to offer some advice on how to pitch Pakistan and KSE there in Indonesia and also, If you can kindly give us the references of the information that you have given at the blog like the returns of KSE. We'll be really grateful to you. AA-NBS: "I would like you to offer some advice on how to pitch Pakistan and KSE there in Indonesia"
1. KSE has a strong track record of investor returns over the last one year, five years an ten years. 2. KSE-100 index has outperformed other emerging markets, including BRICs, by a wide margin for over a decade. 3. The worst case investment risks in Pakistan are already reflected in the deep discounts of valuations of Pakistani shares in terms of price-earnings multiples. 4. KSE-100 shares are trading at price-earnings multiples (P-E ratio) of less than 8, about half of other Asian markets in the region. 5. Pakistanis are a young, resilient nation. The people of Pakisan have defied the dire forecasts made after Swat violence in 2009, and massive summer floods of 2010. 6. After the deluge of Aug-Sept 2010, Pakistan's rural economy has bounced back as reflected in rising tractor sales and bumper crops. 7. The KSE selloff during floods has attracted foreign buying, with over a billion dollars pouring in in 2010. And in spite of the 50% drop in KSE-100 2008,, those who invested and held their shares made a 5X return at the end of 2008, not bad. And, even after the 50% drop in KSE-100 in 2008, any one who bought in year 2000 and held on till 2010, the return would be a whopping 12X, far outpacing returns on BRIC markets or anywhere else. Click here to read a report from JS Global on KSE. For more details, please read posts on my blogs which have lots of data with embedded and related links included. KARACHI: The Karachi stock market managed to close in the green zone on weekly basis due to strong results announcements, analysts said on Saturday. The gains would have been a bit more but all eyes were on the monetary policy announcement where expectations of another 50 basis points hike in the policy rate led the investors to book profits during the week, they added. The Karachi Stock Exchange (KSE) 100-share index gained 30.79 points or 0.24 percent to close at 12,462.70 points as compared to 12,431.91 points of the previous week. “The market started the week under pressure, as the first trading day of the week saw the 100-share index lose 61 points to 12,371 points,” said Invest Capital analyst Asad Siddiqui. “However, from the very next day positive movement was seen, but it remained range-bound between 12,446 points and 12,483 points.” The week saw good results coming in from the fertilizer and refinery sectors, however, the market volumes remained very low as average daily volumes stood at 117 million shares, taking a significant fall of 50 percent. However, tax collections are yet to catch up with the target levels. Conversely, expectations by the country’s fiscal authorities for the fiscal deficit going beyond 8.0 percent and another cut in the development budget of the country by Rs 100 billion from the government, were a few concerns to watch out for. On foreign inflow front, the week witnessed a massive 57 percent decline to only $6.3 million. The multilateral donors have reportedly halted budgetary support to Pakistan and have asked the government to obtain an LOC from the International Monetary Fund. During the outgoing week, all key sectors including banks, oil and gas and telecom ended as under-performers. Autos too remained under pressure post federal cabinet’s approval of increasing the age limit of imported cars up to five years. Moreover, despite healthy results reported by two leading fertilizer makers and rise in DAP prices by Rs 100 per bag announced by Engro, investors chose to book profits in key fertilizer stocks. Foreigners were net buyers of $6.3 million and individuals were the major net sellers, worth $7.7 million. Riaz you should be the finance minister of Pakistan! KARACHI, Jan 10: The more-trusted KSE-100 share index is not the right representative of the 641 companies listed on the exchange. Only one stock–the energy sector bellwether, Oil & Gas Development Company (OGDC), can turn the market topsy turvy. With 25 per cent weight in the index and 82 per cent of the free-float in the hands of foreign investors, the direction of the entire market is at the mercy of Franklin Templeton Investments, which is understood to hold the biggest stake of 400 million of the 648 million free float of the energy giant—almost 80 per cent of all shares held by overseas investors. Dr Joseph Mark Mobius oversees more than 40 emerging market mutual funds, including the Asia Growth Fund that carries OGDC on its books. If the elderly investment guru (Mobius turned 74 last summer) changes his mind on the energy sector prospects in Asia, which he firmly holds to be exceedingly bright and instead seek an exit, the move would have devastating impact on the KSE. OGDC stock price has scarcely looked down since it began climb in early 2007, the price of the 10-rupee share now rules at Rs178. That is at least Rs40 higher than the “fair price” tagged by most analysts at the start of 2010. On Monday, the KSE-100 index pulled back 82.34 points. With OGDC down by Rs2.71, as many as 68 points to the decline were contributed by the share alone. How one mighty stock can overwhelm the rest of the market is clearly demonstrated by the OGDC performance in the outgoing year. Farhan Mahmood, analyst at brokerage Topline Securities, tracks the energy sector. He observes that due to the huge size and limited float with the local investors, it is relatively easy to push the heavy-weight one way or the other. “In the 2010 KSE gains of 28 per cent, as much as 12 per cent were added by the OGDC,” says Farhan. The stock continues to cast its spell well into 2011, since 167 points of the 367 points rise in the first six trading sessions are the blessings of the heavyweight energy stock. Largely corned, OGDC has dropped to 16th place among the most tradable stocks at the KSE with average daily volume of only Rs119 million ($1.4million) during the first six trading sessions of the new year. Out of total $3 billion worth Pakistan equity held by foreigners, 33 per cent was estimated by Topline to be invested in OGDC. The market capitalisation of OGDC on Monday amounted to $9 billion, which made up as much as quarter of aggregate market value of 641 listed companies at Rs3.3 trillion or $89 billion (should be $39 billion?). Many traders defend the rise of OGDC as a choice scrip due to its healthy yield, larger free-float and above all state-controlled majority holding. But all of it is as long as going is good. Since Beginning of 2010, OGDC has contributed approximately 1300 points to the staggering 3000 points rise in KSE-100 Index, which currently is staggering at the dizzy height of 12,307 points. Is it the time to fear and read the mind of Dr. Mark Mobius? In case the foreigners decided to wander away into other markets, the local bourse should spiral downwards to a steep drop. This time nonetheless, the government has the means to plug the hole and calm the market: It has simply to float another five per cent from its majority stake into the market. He said the country has abundant natural resources and skilled cheap manpower but lacks technology. It is a key market of 155 million people. It is gateway to the Central Asian Republics, South Asia and Gulf countries. Population of SAFTA alone stands at 1.4 billion people. The market of these countries including Afghanistan can be effectively and conveniently serviced from Pakistan. In his address the LCCI Senior Vice President Sheikh Muhammad Arshad said that Swiss economy is one of the most developed economies of the world. It has highly advanced industries such as machinery, chemicals, watches, textiles and precision instruments. He invited Swiss Businessmen to invest in Pakistan on 100 percent equity basis or in the form of joint ventures with local industries. Such experiences have been very successful in Pakistan. Bayer, Abbot, Searle, Toyota, Hyundai, Honda, Massey Ferguson, Fiat, Nestle etc. are all success stories. He said that present government has adopted a liberal investment policy and there is no restriction on sending back the principal, dividends, profits and royalties. He urged the Swiss businessmen to come forward and seize upon the unprecedented investment opportunities in Pakistan. ...“The country’s exports, money sent by overseas Pakistanis, balance-of-payments position and foreign exchange reserves have reflected an encouraging growth during July-December FY11, showing strong signs of improvement in the economy,” Saad-bin-Naseer, CEO of Pearl Capital, told Central Asia Online January 28. Pakistan’s exports were $10.97 billion, an increase of US $1.88 billion, in the first six months of FY11. That 21% increase was a very positive sign for the growth of export-oriented industry and the national economy, he said. In FY11 exports could cross the $22 billion mark for the first time because of a significant increase in the value of Pakistani products on world markets, Naseer added. “The textile industry had taken the lead by fetching $1.28 billion in additional foreign exchange through exports,” Anisul Haq, secretary of All Pakistan Textile Mills, told Central Asia Online.“The textile industry had taken the lead by fetching $1.28 billion in additional foreign exchange through exports,” Anisul Haq, secretary of All Pakistan Textile Mills, told Central Asia Online by telephone from Lahore. “From July-December FY11 textile exports increased to $6.28 billion” compared to 2010 figures. Total annual textile exports could exceed $13 billion for the first time, he added. In 2009-10, they totalled $10.5 billion. “The textile industry had taken the lead by fetching $1.28 billion in additional foreign exchange through exports,” Anisul Haq, secretary of All Pakistan Textile Mills, told Central Asia Online. Another pillar of the economy is remittances from overseas Pakistanis. The money they sent home increased by $780m in the first half of FY11, to $5.3 billion, Haq said. “We hope the country would receive $11 billion from overseas Pakistanis in 2010-11 with major increase in inflows from Pakistanis staying in Arab countries and other western countries,” Haq said. Foreign aid from institutions and countries, not just individuals, helped. The disbursement of $633m in coalition support and the extension that the IMF gave the government for imposing the Reformed General Sales Tax (RGST) helped improve some of the major economic indicators, Naseer said. The picture did much to bolster Pakistan’s balance sheet, which has had its ups and downs. Pakistan recorded a current account surplus in the first six months of the fiscal year, which enabled growth in foreign exchange reserves and stabilised the dollar-rupee exchange rate, Pearl Capital’s Naseer added. In 2009-10, the country incurred a $2.5 billion current account deficit from July-December, but for the same period in 2010-11 it enjoyed a surplus of $26m – a dazzling switch from red ink to black, he said. The robust performance of exports and remittances enabled Pakistan to accrue a record $17.3 billion in foreign exchange reserves by January 21, he said. Investor confidence has grown in response to these positive indicators. The stock market capitalisation grew to $36 billion in January 2011 from $32 billion in October 2010, he said, adding that such growth would encourage foreign and local investment. Islamabad, which still hasn’t imposed the RGST the IMF wants, doesn’t collect enough taxes, Khan said. It levies only about 9% of GDP against the required international standard of a minimum 15% tax-to-GDP ratio, Khan said. The government must implement tax reform, reduce reliance on borrowing from the IMF and generate its own resources to enhance tax revenues and to bolster economic growth, he added. Serious efforts to solve chronic gas and power shortages are also imperative, he said. Pakistan’s budget deficit may cross 5.5 percent of the gross domestic product (GDP) due to less than expected revenues, excess expenditure on floods, security and subsidies. According to the report, severe floods in July-August 2010 have affected fiscal year (FY) 2011’s prospects. Damage was less severe than initially feared, but agriculture and communications were hit hard. The report says that Pakistan’s public debt (excluding guarantees) as a share of the GDP continued to climb in FY 2010. Government domestic debt amounted to 37.0 percent of the GDP, including commodity debt and liabilities of State Owned Entities (SOEs). External debt rose to 31.9 percent of the GDP, including 0.6% of the GDP in external liabilities of SOEs. Interest payments due on domestic debt represent a heavy burden, accounting for 3.9 percent of the GDP in FY 2010, or 43 percent of the Federal Board of Revenue’s (FBR) revenue. External debt amortisation payments, excluding amounts owed to the IMF, are relatively stable for FY 2010 – FY 2013 at about $3.3 billion. Amounts due for FY 2012 and beyond will be raised substantially by repayment obligations to the IMF. The report maintains that the inflation accelerated after the floods, to 15.7 percent in September, reflecting actual and expected shortages. It remained above 15 percent through December, falling to 14.2 percent in January owing to a government-freeze on oil and electricity prices. It is expected to stay high through FY 2011, for an average annual 16.0 percent, and is then expected to recede in FY 2012 to 13.0 percent (moderation in international food prices is likely to be at least partly offset by electricity price rises). ADB expects Pakistan’s economy to continue to build on the vital signs of recovery. The good news is that Asia is maintaining a strong growth trajectory, and expanding South to South links presents supplementary opportunities for developing Asia, including Pakistan. Pakistan’s recent entry into Central Asian Regional Cooperation (CAREC) opens up new trade and development corridors ... but it all depends on getting back on course in implementing the fiscal reforms and creating an enabling environment for the industry and job creation for the youth in the years ahead, the ADB country director added. The total disbursements made to Pakistan by ADB during the calendar year 2010 were $799.18 million that were 117 percent more than the projected amount of $683.28 million. According to the report, Pakistan’s external reserves reached a record-high of $17.4 billion in early February 2011, amounting to more than five months of imports of goods and services. This build-up essentially reflects IMF releases of $7.1 billion under the Stand-by Arrangement programme, an additional $450 million in emergency support in September 2010, and support from the Coalition Support Fund ($633 million). “We are looking at a growth rate of four percent for the next year because of a good services sector and on the hope of better farm output,” said a Finance Ministry official who did not want to be identified. The figure compares with a 3.7 percent growth forecast by the Asian Development Bank (ADB) in its Outlook 2011 report released on Wednesday. The ADB expects persistent energy problems and security issues will continue to check Pakistan’s growth in 2011/12, with surging inflation posing a further major risk. Last year, the worst-ever floods that hit the country inflicted $10 billion in losses, forcing officials to slash growth estimates in between 2.5-3 percent for the current year, down from an expected 4.5 percent. The services sector, however, is likely to grow by four percent in the current year to June and there are signs that the farm sector is recovering from the flooding. Higher cotton, rice and sugar output is expected in the coming year, analysts said. “We expect that 2011/12 will be much better than this year ... Our own (growth) forecast is close to 4.5 percent,” said Sayem Ali, an economist at the Standard Chartered Bank. An official at the Planning Commission, which prepares growth targets, also spoke of likely four percent growth next year, but said that was contingent on continuing support from remittances from Pakistanis working abroad and on exports, which have grown by 20-25 percent during the first eight months of the current financial year. However, the large-scale manufacturing sector, which dominates the overall industry making up 12.2 percent of Pakistan’s GDP, remains a major concern as it faces chronic energy shortages and high interest rates that discourage private sector borrowing. The sector grew 1.03 percent up to January, against 2.34 percent during the corresponding period last year. “Energy shortfalls are lowering real growth by at least two percentage points annually,” the ADB said in its report. Improved prospects for Pakistan’s economy, however, will largely depend on the implementation of measures to address key problems such as inflation, the budget deficit and the need for transparent revenue policies, according to the ADB. “Increasing prices are on the warning level, not just for Pakistan, but for the whole region,” said Rune Stroem, ADB’s Pakistan country director. The ADB forecasts inflation in Pakistan will quicken to 16 percent in 2011, the highest in Asia. Revenue generation is another grey area. The central bank chief said this week that quick steps were needed to broaden the tax base in Pakistan, which has one of the lowest tax-to-GDP ratios in the world, currently around 10 percent. The IMF has not yet released the latest tranche of the $11 billion loan due in May last year because of the government’s inability to implement a reformed general sales tax, seen as a key to expanding the tax base. The fiscal deficit, meanwhile, is expected in between 5.3 percent and 5.5 percent of the GDP in 2010/11, but could be higher if some external flows, including grants, are not received soon. Stroem said that 5.5 percent deficit estimates seemed unrealistic and there are signals that these might slip even further. All the “reform processes” are on hold in India for the past six months due to scams in various sectors in the Indian economy. Reforms in FDI in Retail, Insurance and Defense etc are in the “cold storage” since January 2011. FDI into India for the period - January to June 2011 is one-ninth than that of China in the same six month period. Plus Indian fiscal deficit is ballooning due to high crude oil prices and Indian Government’s inability to dismantle APM for petroleum products as mentioned above. Such low level of FDI is not a good sign for the Indian Economy. JFI - Indian trade account deficit for last financial year was US $ 105.00 billion. We predict that RBI will further raise interest rates, when its Board meets for monetary policy discussion in the last week of July 2011. We expect a 50 bpts hike in Repo rates by RBI in the last week of July 2011. Analysts feel that the hike will only be to the tune of 25 bpts. Let us wait and see. RBI is willing to sacrifice GDP growth in India at the cost of reining in inflation. We predict that Indian equities will be range bound for the month of July 2011, with a bearish undertone. The levels are as per above figures. But we are bearish for the Indian equity markets for August and September 2011. We will see BSE SENSEX levels lower than 15960 in Q3 2011. By the way Credit Suisse said in its report of June 2011 to its investors that it predicts BSE SENSEX to be around 16000 in Q3 2011 ? We said this or near about (15960) in Q1 2011 ? AOTC – my problem ! Profitability Despite economic slowdown due to a host of reasons including political uncertainty, high inflation, acute energy shortage, currency depreciation and high interest rates, the Company achieved sales of Rs 3.4 billion in FY09, which is 12 percent lower than FY08 sales of Rs 3.8 billion. The decline in sale compared to last year was due to lower prices of the Company's products, a sharp decline in copper prices during the first half of the financial year, and reduction in demand as a result of the overall economic situation in Pakistan. The sales increased by 13 percent in the FY10, reaching Rs 3.8 billion. This was possible due to increase in the price of the product as well as better sales volume. During FY11, in addition to the economic slowdown and poor law-and-order situation, the year had to face the floods. Despite this, Pakistan Cables was able to increase its sales by 7.8 percent from last year's figures and touched Rs 4.1 billion. Even with lower sales in the FY09, gross profit increased by 43.7 percent from FY08 values, reaching Rs 532 million. Better sales' mix, reduction in copper prices, productivity improvement and cost savings initiatives are the main reasons for this outcome. In FY10, the gross profit figure fell to Rs 412.3 million, due to the expenses that could not be passed on to the customers. These include devaluation of rupee against the dollar (which increased the cost of inputs and copper prices) and taking orders at lower margins due to market competition. Improvement in productivity, better sales' mix, improved margins and operational efficiencies contributed to the rise in the gross profit for the FY11, which amounted to Rs 519.6 million. The dedication of the Company's management in improving the efficiencies, controlling costs and making decisions for the optimum product mix resulted in the Company's Profit before Income Tax soaring to Rs 101.8 million in FY09 as compared to Rs 53.6 million in the previous year. This amount stood at Rs 146.7 million in FY11. In FY09, normalisation of the tax expenses in the year affected the profit after tax figure, which fell from Rs 65.4 million in FY08 to Rs 63.9 million in FY09. The net profit value continued to fall despite lower interest expenses, and in FY10, the figure touched Rs 45.5 million. At the end of FY11, the profit after tax amounted to Rs 85.7 million, an increase of 88 percent from last year. MSCI, a leading provider of investment decision support tools worldwide, has maintained status quo in its February 2012 review with Pakistan stock market’s weight remaining intact. According to the results of the Quarterly Index Review announced by MSCI, two companies – Sacombank (Vietnam) and Ceylon Tobacco Co (Sri Lanka) – will be added to the MSCI Frontier Market Index but there will be no deletion. For Pakistan, which is among 25 countries of the Frontier Market Index, no change was made in the existing 13 companies. In May 2009, Pakistan was included in the Frontier Market. Since then, MSCI has been reviewing Pakistan’s situation due to limited number of sizable securities. In 2011, though Pakistan posted a negative return of 17%, it outperformed all the Frontier Markets in Asia. Sri Lanka declined by 29%, Vietnam posted a negative return of 40% while Bangladesh lagged behind to post a negative return of 44%. “While the next MSCI review is due in May, the annual review in June could be crucial. A near-term positive that Pakistan can hope for is an upgrade of UAE and Qatar to Emerging Markets as it will lead to 130-basis-point weightage gains,” says KASB Securities in a research note. The Karachi Stock Exchange has carried out the exercise of re-composition of KSE-30 Index for the review period from January 1 to June 30. The re-composition has been carried out on the basis of the pre-requisites/criteria of selection of companies and as a result thereof, three companies would be affected due to re-composition, a KSE notice issued here on Wednesday said. The three incoming companies are Fatima Fertilizer Company Limited, Engro Foods Limited and Jahangir Siddiqui and Company while the three outgoing companies are ICI Pakistan Limited, Lotte Pakistan PTA Limited and Nestle Pakistan Limited. The recomposed KSE-30 Index, based on the prices of June 30, will be implemented with effect from August 15. After re-composition, the KSE-30 Index companies include Fauji Fertilizer Company Limited, Oil and Gas Development Company Limited, Pakistan Oilfields Limited, MCB Bank Limited, Pakistan Petroleum Limited, Engro Corporation Limited, National Bank of Pakistan, Lucky Cement Limited, Pakistan State Oil Company Limited, The Hub Power Company Limited, Fauji Fertilizer Bin Qasim Limited, DG Khan Cement Company Limited, Attock Refinery Limited, United Bank Limited, Nishat Mills Limited, Fatima Fertilizer Company Limited, Engro Foods Limited, Arif Habib Corporation Limited, Habib Bank Limited, Bank Al Falah Limited, Bank Al Habib Limited, Attock Petroleum Limited, National Refinery Limited, Jahangir Siddiqui and Company Limited, Pakistan Telecommunication Company Limited, Unilever Pakistan Limited, Kot Addu Power Company Limited, Millat Tractors Limited, Adamjee Insurance Company Limited and Dawood Hercules Corporation Limited.